A bookmark group in Google Issue Tracker is a collection of hotlists and saved searches. Bookmark groups allow you to easily collect and track sets of issues. Bookmark groups are also a convenient way to collaborate across entire projects or products. When you create a bookmark group or add a bookmark group, the group appears in the left-hand navigation with an expandable button in the Bookmark Groups section. Expanding a bookmark group shows the saved searches and hotlists that make up the group. Saved searches appear in italics. If you own or separately subscribe to a saved search, it appears in both the bookmark group and in the Saved Searches section of the left-hand navigation pane. A hotlist that is part of a bookmark group only appears within that group, regardless of whether you own or subscribe to the hotlist. Bookmark groups are uniquely identified by an ID number, not by name. As a result, different bookmark groups can have the same name and may be difficult to differentiate. You should generally choose a unique name when creating a bookmark group. When you create a bookmark group, you have Admin permission for that group. You can give additional users Admin permission for the group. You can also remove yourself as an Admin for the group, though there must be at least one Admin listed. Once you remove yourself as an Admin, only a user with Admin permission can give you back the permission. If you don't have the View Only permission, you are unable to access the bookmark group at all. Most management tasks for a bookmark group are performed on the details page for the bookmark group, which requires Admin permission to access and change. If you are on the homepage or dashboard for the bookmark group, you can access the details page with the pencil icon located next to the bookmark group name. You can also access the details page with the Settings option in the drop-down menu for the bookmark group, located in the left-hand navigation. A user must be an Admin for the desired saved search in order to add it to the bookmark group. A user must have at least View Only permission for the desired hotlist in order to add it to the bookmark group. 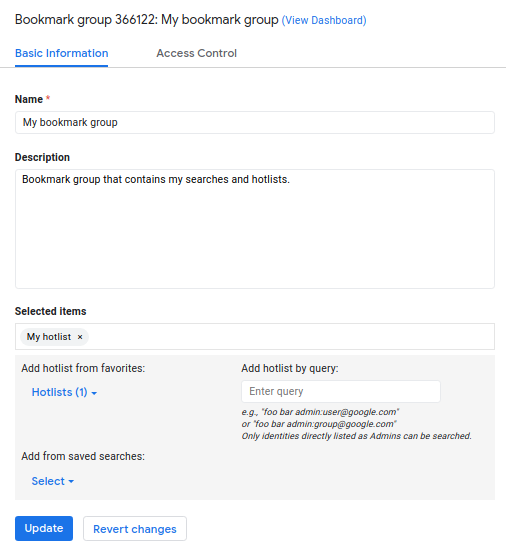 An Admin of a bookmark group can also edit or archive the group. When archived, a bookmark group no longer appears in the left-hand navigation of users who starred it. An archived bookmark group is not returned in a bookmark group search and only appears in the Archived section in the left-hand navigation of the users who have Admin permissions.